For information, it will not be possible to have the wagon train or the percherons back this year. This is mainly because the owner of the former wasn't best pleased that his wagon was broken when Cyrano fell and the latter is naturally coming to terms with the lost of Cyrano. However, a local association has been contacted to supply a substitute: A team of donkeys with packs! Now this will make us more manoeuvrable but will definately put limits to what we can carry. At the moment, I am thinking about using them to carry the sutler-women's goodies and perhaps so of the officer's camp kit. The cost of hiring would be included with your participation...and we'd also need to get some civilian clothing for the person (woman) accompanying the donkeys (any offers)? Please, ask this woman for her clothes size and I'll bring a chemise and a dress for her with me. 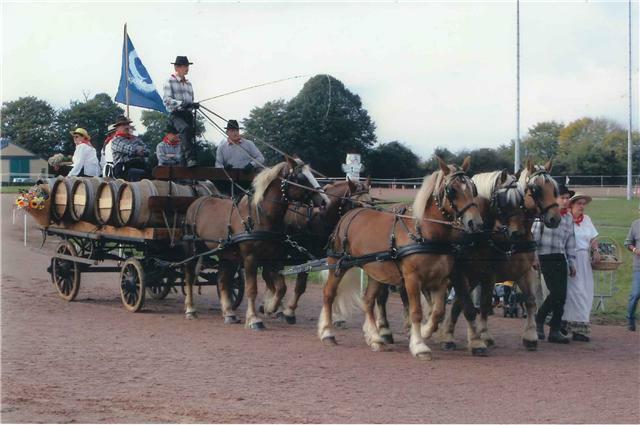 Well, I've just received the quotes for the hiring of a waggon + 2 men + 2 horses for LBE 2010. The gentleman is offering 2 different sort of waggons. 1) It's a waggon much like the one we had in the past. Price = 1.500 € + 5.5% VAT. 2) It's a flat-top waggon for transportation of barrels of wine. Price = 1.800 € + 5.5% VAT. The prices, as you can see are high...alot higher than I had expected before fixing the 15 € participation fee per participant. Now what are your thoughts and reactions? I'm trying to bring the price down abit but let's work with these prices for the moment (to be honest, I doubt he'll come down much if he should do so). Are you willling to pay (upon calculations, it would mean jumping from 15 € to 25 € per participant to be able to cover the waggon and the rest) more for a waggon or do you prefer to just forget the idea? last time it was of no use to us in the cavalry. 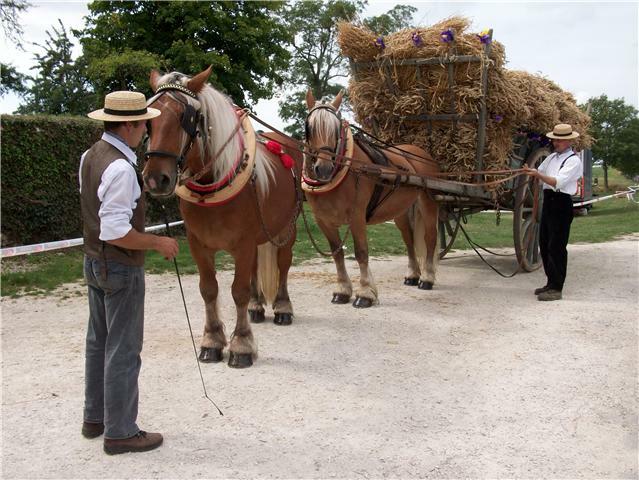 As everything we carry is on our saddles, the only items we had on the cart was our rations - which we then had to carry back with us to the stables thus negating the point in putting them on the cart in the first place. I think we may have even lost the wine as we were unable to carry that back. I certainly won't cry if it is not there. That said, it did make th eevent that little bit more special, as well as giving a very real objective for the French and something for the allies to defend. Making a road thorugh the woods for it was also a new experience..! I prefer the hay waggon, looks more agricultural and better able to handle those small tracks. Given the option, I would always plump for having the waggon, as a focal point. The price does seem a bit steep, perhaps bite the bullet this year and keep looking for an alternative. How are we going to dress the waggoneers? Don't want them fouling it up with rubber soles.. If donkeys are not available, then I think the hay cart for sure. E10 more for a more immersive experience... its a "no brainer". I'd like to thank everyone who participated in the wagon debat and I've taken all your answers (which were pretty positive) into account. I am very much happy to advise you that the owner of our normal wagon has offered to let us make use of his wagon for 2010...However, he did insist that a fee of 1.000 € be the price for his service (this would include the wagon, the wagon-owner and a horse from his stable) for the weekend. Having taken into account the general feeling of the participants and considered the other quotes, I've accepted his offer. As such, I can now confirm that the participation subscription per participant for LBE 2010 is fixed at 20 €. - Canteen goodies (I will need everyone's help on this one as we would need period-friendly containers to be able to put the food and bottles that our sutleresses will have the pleasure of selling to you). I think that we would also need some form of big rope to be able to put on the side of the waggon to avoid things flying out. I think you have just posted in the wrong topic.